Black smoke was highly visible between Trent and Sweetwater Monday as a wind turbine at the Trent Wind Farm caught fire. Sweetwater Fire Chief Grant Madden said crews from his department and from the Trent Volunteer Fire Department were sent to the location just south of Interstate 20 and east of Lake Sweetwater at 10 a.m. The wind farm is owned by GE Power, Madden said. Due to recent rains, the area was not too dry and firefighters were able to contain the blaze to a small area. In October 2011, volunteer firefighters from the Elm Creek Citizens Association, Buffalo Gap and View put out a wind turbine blaze, which fire officials said sparked a grass fire in the Callahan Divide Wind Energy Center. 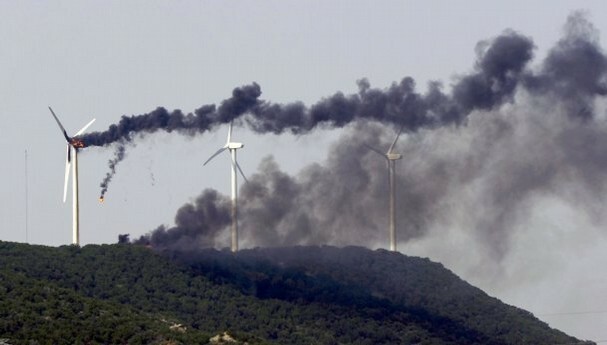 The fire was the second turbine blaze in the area during that time. 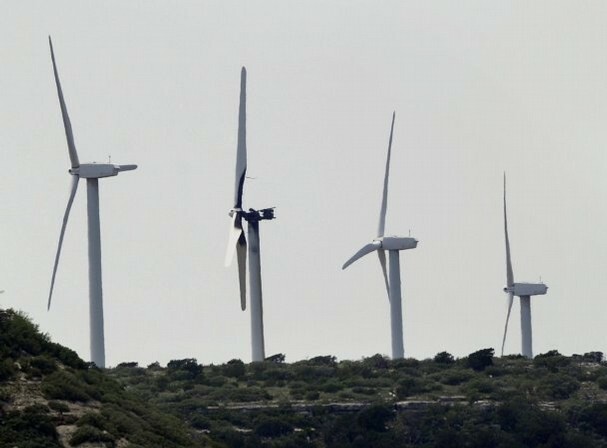 West Texas has more than 2,000 wind turbines, and the number continues to increase as development costs fall and wind turbine technology improves. More than $1 billion in new investment is pending for 2013 construction. The fire Monday was limited to a single turbine. The last firetruck left the scene some three hours after the initial call. Burning fragments fall from a wind turbine on the Trent Wind Farm Monday. The fire could be seen from Interstate 20 and seemed to burn out after an hour. Light shines through the burned-out module of a wind turbine (second from left) on the Trent Wind Farm Monday. Shortly before 11 a.m., the turbine caught fire and could be seen burning from Interstate 20.